Ashley’s Boarding Kennels raises funds to help less fortunate animals at home and abroad. Ashley’s family has been involved in animal rescue for over 20 years. We look after dogs who are waiting for new homes after finding themselves in council pounds. 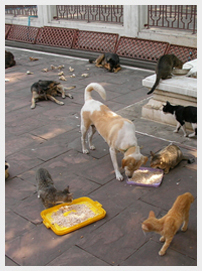 We support a charity in Thailand which feeds and neuters street dogs and cats to keep the numbers manageable and give them better lives. We have helped a dog rescue in Bosnia bring dogs off the street to safety. We work closely with the north London charity All Dogs Matter.